How Can A Car Mechanic Help You In Cooling System Repairs? The cooling system of the car plays an all-important role in the performance of the vehicle. And it is very important to make sure that your engine never becomes too hot, which can result in overheating and melting. Seek help from the car service centre. There the professionals are experienced and skilled and are equipped with tools who can help you installing the cooling system that can keep your engine at the right temperature and make sure that your car runs smoothly. 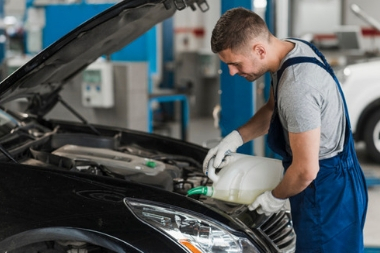 Antifreeze/ Coolant - A antifreeze is there within the vehicle that not only keeps components from freezing but also it has got anti-corrosive and anti-boil properties that flow through engine and radiator, it ensures that everything just works fine and work according to the right temperature. Like any other liquids, antifreeze also breaks down in time, so it must be replaced after travelling every 24,000 miles. Antifreeze is an important component of your vehicle and so it should be maintained regularly by professional car service centres. They will carry out the inspection and will make necessary repairs needed. Cooling Fan - Cooling fan is responsible to circulate air throughout the radiator so that it can be able to release engine heat to the surrounding. If anyhow those cooling fans malfunction and your engine can quickly get overheated. Hire professionals, they will inspect the cooling fan and the drive belt. Driver belt basically powers up the fan and if it is cracked or loosened, then disruption may occur. Car repair experts will repair and replace damaged fans. Pressure Cap - Have the professional inspect your pressure cap at least once a year to ensure that there is a proper seal. Coolant Reservoir - Car service providers inspect the coolant reservoir during every routine maintenance inspection, the role of coolant reservoir is to check the level of coolant in the system, car repairing experts check whether the level is up to the mark to work smoothly. Thermostat - A thermostat if performed poorly can result in poor fuel economy, overheating and other related issues. Thus it is the responsibility of the thermostat is to make sure that it is working properly. Heating And Air Conditioning - Seek help from the car mechanics, they will inspect the HVAC system that feels you comfortable when you stay in the vehicle’s cabin. Our mechanics check hoses, inspect heating core, system’s refrigerant. How a car mechanic can help you in repairing the cooling system of the car has been stated in the details above. In Lilydale, you can find several car repairs and servicing experts, select the service of the one you feel convenient.